Date: Tuesday, June 25th, 3:30 -5:00 p.m. Please RSVP to carol.madden@dal.ca by June 21st. Please join us for the inaugural lecture of Dalhousie University Transportation Collaboratory’s (DalTRAC) Distinguished Lecture Series. 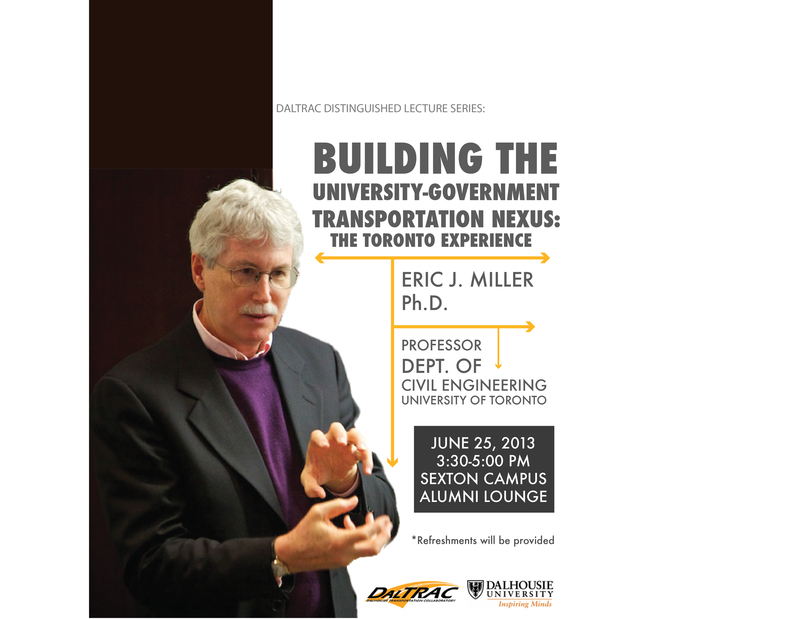 Dr. Eric Miller will share Toronto’s experience in university-government partnerships with respect to transportation data, analysis and modelling. The presentation will also include an overview of integrated urban modelling research that has been supported by this collaborative R&D environment. Check out this resolution in the legislation that mentions EAC and DalTRAC and Child Safety Link! Bike tune-ups will be offered in front of the Studley Gym from 1:00 pm – 4:00 pm on June 18th. Come get your bike ready for summer. CycleTracks Study: Record your rides & enter to win! 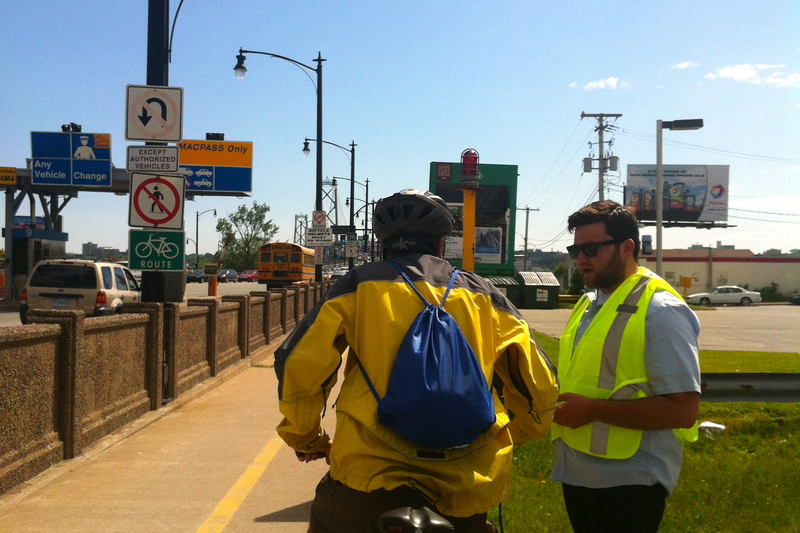 DalTRAC is experimenting with new ways of doing active transportation data collection by employing smartphone apps! Cities around the world are exploring the use of GPS-enabled smartphones to collect data on route choice, travel behaviour, potholes, and more! 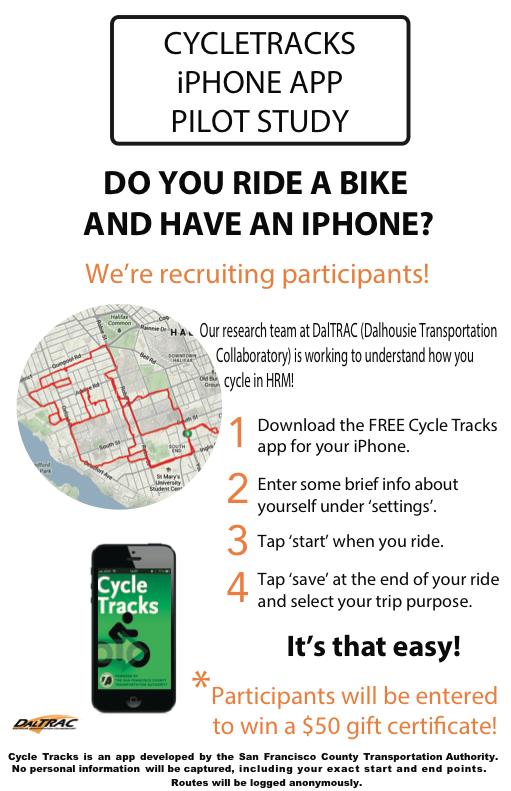 We will be doing a pilot study in the Halifax Regional Municipality using Cycletracks, a free app developed by the San Francisco County Transportation Authority. This will help us understand how cyclists move around with respect to trip purpose, gradients, road types, and much more. Participants will enter to win a $50 gift certificate to Mountain Equipment Co-op! 1. Download Cycletracks. Currently, anyone who has an iPhone can download the app. Unfortunately, this app does not work on Androids in Canada. 2. Enter a few brief points about yourself under the ‘settings’ tab, such as your gender, and postal codes of your home and work. 3. Click “start” at the beginning of your ride, and “save” once you have reached your destination. We encourage you to do this for every ride that is done entirely by bicycle. 4. Select the type of ride. You will be prompted to choose from a variety of trip purposes, such as “commute” or “recreation”. Is Transit the key component to transit oriented development? Daniel Chatman thinks NOT.